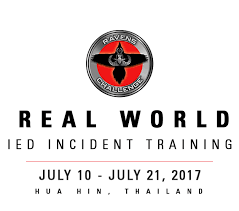 The Near East Center for Strategic Engagement is proud and honored to be a strategic partner of this year’s Ravens Challenge® in Hua Hin Thailand, 10-21 July 2017. Hosted and facilitated by Royal Thai Police Special Operations Division Unit 191 (EOD), and the Thai EOD and counter-terrorism community, Ravens Challenge® will be attended by teams from Thailand’s EOD teams (police, military, private), the Thailand Bomb Data Center, Royal Thai Police Science and Forensics Department, and many other C-IED and EOD personnel. Additionally, ASEAN and a global EOD / C-IED event and American, UK, Philippines, Cambodian, Malaysian, and other national teams and representatives will be taking part in the event. NEC-SC, along with private companies, will provide on-site technical and training support to ensure the best training and exercise event globally.